Young workers march in a solitary line down a private beach in front of the Papaya Playa Project, an upscale hotel estate, to clear seaweed that has collected overnight in Tulum, Mexico. Marc Antonio, one of just a few workers in charge of clearing the mounting seaweed at a small beach front hotel property, sweats in the afternoon sun in Tulum, Mexico. "There's only three of us, and it gets worse every day. It's like we were never here." Oscar,* a migrant worker originally from Chiapas, Mexico, rakes away seaweed that has amassed overnight in front of a luxury hotel and resort in Sayulita, Mexico. He travels to the region seasonally along with the majority of the men who do this work. Raul* walks up a makeshift ramp atop a mass of rotting seaweed in the jungle in Tulum, Mexico. The local workers first fill their wheelbarrows from the beach, then proceed across the road, through the jungle, and finally to the massive pile. Two workers, employed by an upscale beach resort in Tulum Mexico, tell me they usually work around eight hours a day in the unforgiving Mexican sun; it tends to be closer to 12. The newest resident of Tulum, along with droves of bloggers, wealthy tourists, impatient developers and yogis is Sargassum seaweed, a genus of brown microalgae native to places like the Sargasso Sea in the North Atlantic and parts of Brazil. days will go by and seaweed will amass, emitting a smell resembling that of rotten eggs. The seaweed collects garbage, which can disturb fishermen as well as the preexisting ecosystem, causing detrimental issues in a town that already has incredibly weak garbage and sewage systems, made even weaker by the influx in tourism in recent years. An older member of this work group, 22, directs a younger member, 14. 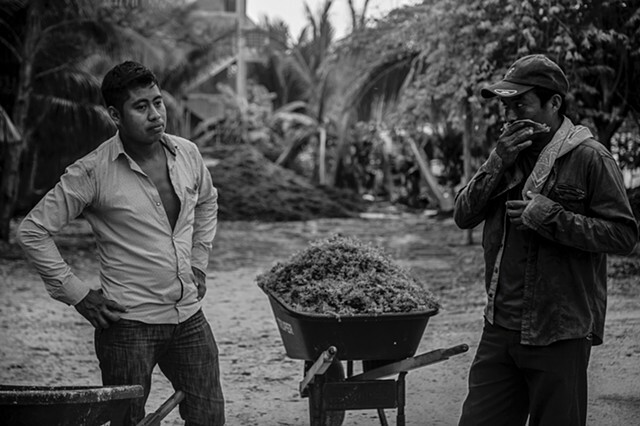 The ages of the migrant workers that come into Tulum, Mexico to do this regional work range greatly; I came across ages 11- 49. These young men use rakes, wheelbarrows, and little else; this part of the beach isn't accessible by tractor, so everything is done slowly and manually. The homemade tattoo of a young worker shines in the morning sun as the group makes a plan for the day in Sayulita, Mexico. At the end of the day, the men will take what has amassed in the jungle to Sagarpa, a dump in town, to be incinerated. Rodolfo, a local resident who works in the beach town's restaurant industry, wades through the early morning waters littered with brown Sargassum, and shows me the biggest changes the town has undergone since he first arrived in 2014. Marine and wild life, as well as coral reefs and other living ecosystems are at risk because of the nonnative seaweed's introduction into the community, but because it's difficult to sample, limited information is known about the species and its drivers. A lone worker looks down the once-pristine beach cove in Sayulita, Mexico, now littered with seaweed. The microalgae floats on the ocean surface and ultimately moves onto shore en masse, but it's incapable of being predictive as a plant species.